The Raise Foundation is dedicated to stopping the cycle of abuse through education, advocacy, community collaboration, and comprehensive services for families and children. Since 1974 we have grown into a dynamic, well-respected, non-profit organization serving all of Orange County. The goal of The Raise Foundation is to provide resources to strengthen families, making each family’s home a safer place for children to grow up. With over 38,000 cases of reported child abuse and neglect in the county each year, it is clear that prevention programs and services are desperately needed in every Orange County community. Since 1974 the goal of The Raise Foundation has been to prevent child abuse by strengthening families. By collaborating with other family-serving agencies we maximize impact while reducing duplication of services. We provide resources to build better parents, who in turn, will build better kids, and together build a better community. 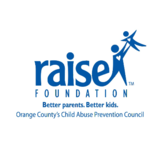 The Raise Foundation is Orange County’s Child Abuse Prevention Council as officially designated by the Orange County Board of Supervisors (Resolution No. 74-492) in 1974. This is in keeping with the California Welfare and Institutions Code (Section 18982) which requires every county to have a child abuse prevention council. We became incorporated as a private non-profit 501(c)(3) agency in 1987 under the name The Child Abuse Prevention Council of Orange County. In 1999, we changed our name to Prevent Child Abuse – Orange County. We became The Raise Foundation. Better parents. Better kids. TM in 2003. Join Our Friends of Raise Committee! Join our Kids Table Committee!